Michael Jordan was a three-year starter for the Buckeyes and the first true freshman offensive lineman to start a season opener since Orlando Pace. Jordan spent his first two seasons at left guard, but moved over to center last summer. He ended up being named a First-Team All-American, but fell short in OSU’s attempt for a third-consecutive Rimington winner. His performance was still plenty good enough to convince him he was ready to give up his final season of eligibility in order to enter the NFL Draft. Had he chosen to return, however, there was a plan already in place to move him back to guard in order to make way for a new starting center. Redshirt sophomore Josh Myers has been talked about as the guy who would have moved Jordan back to left guard. In fact, according to both Myers and offensive line coach Greg Studrawa, it could have happened last season if the need had ever arisen. Myers may be the name everyone expects to emerge, but the Buckeyes have also signed the nation’s No. 1 center in each of the last two classes. Matthew Jones, now a redshirt freshman, was the top center in the 2018 recruiting class. He enrolled early a year ago, so he is experiencing his second offseason and soon his second spring camp. Five-star prospect Harry Miller won’t arrive until the summer, and he will still need to master the position he has been brought to Ohio State to play. By the time the middle of fall camp rolls around, it would not be a surprise if only two of these three are still playing center. Harry Miller won’t be on campus this spring, so it will just be Josh Myers and Matthew Jones competing. 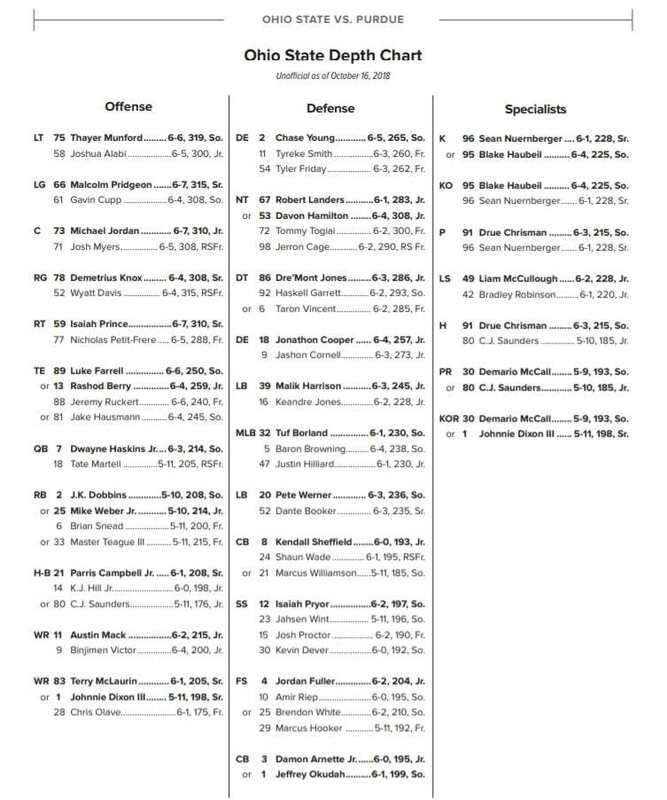 There will be another body or two in there, but don’t expect them to climb the depth chart too far. Myers will likely open with the ones, while Jones will get plenty of reps with the twos. Greg Studrawa will be looking for Myers and Jones to display the two key ingredients of being a center. They will need to be athletic and they will need to be intelligent. They have to make the correct calls and they also have to be able to snap and then get to their proper spots. If they can only do one or the other, that won’t be good enough. Josh Myers is comfortable being Ohio State’s center, which is half the battle. He got to experience life with the ones during bowl practice and things went very well for him and the offensive line. He might seem a bit young as a redshirt sophomore, but he’s three years into the program just like Michael Jordan was last season. It will be interesting to see what happens between Harry Miller and Matthew Jones. Will Miller be able to keep himself from being redshirted? And will there even be the opportunities to make that happen? Keep in mind, true freshman Nicholas Petit-Frere was the No. 2 right tackle last season, but only saw action in three games and redshirted. While the Buckeyes will want three guys capable of being center, will they choose to keep both Jones and Miller there throughout the season? Could Jones show enough to get time at guard? Which would leave Miller as Myers’ backup? As we saw with Pat Elflein and Billy Price, however, even though Price wasn’t listed as Elflein’s backup, he was the de facto backup center. 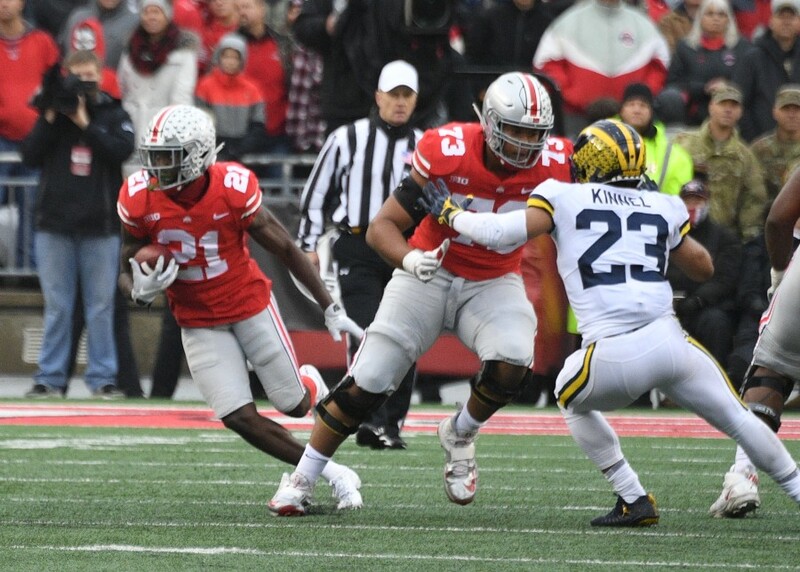 Jones could possibly be that for the Buckeyes in 2019 while Miller gets his footing. Or maybe Miller will start out at guard and learn the offense first before being tasked with making any calls. There are plenty of questions yet to answer, but the easiest of them would have Josh Myers winning the job this season.